Objective To describe the disease course after the cessation of infliximab in early rheumatoid arthritis patients with disease activity score (DAS)-steered treatment and to identify predictors of persistent low disease activity. Methods In a post-hoc analysis of the BeSt study, disease activity and joint damage progression were observed in patients treated with methotrexate plus infliximab, who discontinued infliximab after achieving low disease activity (DAS ≤2.4) for 6 months. Predictors were identified using Cox regression analysis. Results 104 patients discontinued infliximab, of whom 77 had received infliximab plus methotrexate as initial treatment. Mean DAS at the time of infliximab cessation was 1.3, median symptom duration was 23 months and median Sharp/van derHeijde score was 5.5. The median follow-up was 7.2 years. Infliximab was re-introduced after loss of low disease activity in 48%, after a median of 17 months. The joint damage progression rate did not increase in the year after cessation, regardless of flare. After re-introduction of infliximab, 84% of these patients again achieved a DAS ≤2.4. In the multivariable model, smoking, infliximab treatment duration ≥18 months and shared epitope (SE) were independently associated with the re-introduction of infliximab: 6% of the non-smoking, SE-negative patients treated <18 months needed infliximab re-introduction. Conclusion Cessation of infliximab was successful in 52%, with numerically higher success rates in patients initially treated with infliximab. Of the 48% who flared, 84% regained low disease activity. The joint damage progression rate did not increase in the year after cessation. Smoking, long infliximab treatment duration and SE were independently associated with re-introduction of infliximab. In the BeSt study, a study comparing four different treatment strategies, infliximab was the TNF blocker used in combination with methotrexate, either after failure on at least three non-biological disease-modifying antirheumatic drugs (DMARD), or as initial treatment. In this post-hoc analysis with a median follow-up duration of 7.2 years, we investigated whether and how often low disease activity was sustained after the cessation of infliximab and if predictors for successful cessation exist. Second, we looked at joint damage progression after infliximab cessation and we assessed the success and safety of re-introduction. Between 2000 and 2002, 508 patients were included in the BeSt study, a multicentre randomised single blind clinical trial designed to compare four different treatment strategies in DMARD-naive patients with recent onset, active RA. All patients fulfilled the 1987 American College of Rheumatology inclusion criteria for RA. The ethics committees of all participating centres approved the study protocol and patients gave their written informed consent. Treatment strategies were initial monotherapy, step-up combination therapy (groups 1 and 2, both starting with methotrexate), initial combination therapy with methotrexate, sulfasalazine and prednisone (group 3) and initial combination therapy with methotrexate and infliximab (group 4). Treatment was adjusted to the next step in the protocol in the case of a disease activity score (DAS) greater than 2.4 or side effects. We analysed all 104 patients in groups 1–4 who discontinued infliximab after the DAS was 2.4 or less for 6 months, who had at least one year of follow-up after reaching this point. The median follow-up duration from the time of infliximab discontinuation was 7.2 years (range 14–103 months). After cessation of infliximab, whether patients had to restart infliximab due to a DAS greater than 2.4 was monitored. Radiographs of the hands and feet were taken at yearly intervals. For the x-ray ‘at cessation’, the x-ray taken closest to the visit at cessation was used. For stop visits in between 2 yearly visits, the yearly visit before cessation was chosen. All available x-rays of the hands and feet, baseline–1–2–3–4–5-year follow-up were scored blind for patient identity and random in time using the Sharp/van derHeijde score (SHS). Joint damage progression in the year before and after cessation was defined as an increase in the average score for those years of two independent readers. Smokers were defined as patients smoking cigarettes, cigars or a pipe at baseline. Baseline and disease characteristics were compared between patients from the initial and the delayed infliximab treatment group, using the χ2, Student's t or Mann–Whitney U test. Joint damage progression and health assessment questionnaire (HAQ) scores were compared for patients with sustained DAS of 2.4 or less and patients who had to restart infliximab using the χ2 and Mann–Whitney U test. To compare damage progression in the years before and after cessation and HAQ scores at and after cessation, the Wilcoxon signed-rank test was used. To take into account the difference in follow-up after cessation between patients, we used Cox regression analyses to identify predictors of successful cessation, after verifying that the proportional hazards assumption was not violated.11 The dependent variable was time to the re-introduction for patients who restarted infliximab, 1 August 2010 for patients with sustained DAS of 2.4 or less who were still under follow-up, and time to last follow-up visit for patients lost to follow-up. We examined the association between baseline characteristics and clinical parameters at the time infliximab was stopped, with successful cessation of infliximab. Because of the number of variables tested, we considered p<0.01 to be significant. Infliximab was discontinued after achieving a DAS of 2.4 or less for 6 months or longer in 104 patients (figure 1): 77/120 from the initial infliximab treatment group and 27/109 from the delayed treatment group (p<0.001). The mean DAS at the time of cessation was 1.3±0.6 (SD). The median infliximab treatment duration was 11 months (IQR 9–17). The median symptom duration at the time of cessation was 23 months (IQR 15–35). In 20 patients the infliximab dose had been increased from 3 to 6 mg/kg, to 7.5 mg/kg in 13 patients and to 10 mg/kg in five patients before a DAS of 2.4 or less was achieved. Flowchart of the study. DAS, disease activity score; IFX, infliximab. After the cessation of infliximab, the DAS remained 2.4 or less in 43/77 patients (56%) from the initial treatment group and 11/27 (41%) from the delayed treatment group. Methotrexate was then successfully tapered (with 2.5 mg every 4 weeks) to a maintenance dose (≤10 mg/week) in 34 patients (62%), without differences between the initial and delayed treatment groups (p=0.58). Subsequently, 15 patients (27%) from the initial treatment group achieved drug-free remission. None in the delayed treatment group achieved drug-free remission yet. In the delayed treatment group, the median (IQR) time from baseline to starting infliximab was 14 months (11–18). Patients in the delayed treatment group had a higher baseline DAS and needed longer infliximab treatment before infliximab could be discontinued than patients in the initial treatment group. At the time of infliximab discontinuation, patients in the delayed treatment group had longer symptom duration and a higher SHS, HAQ and patient's assessment of disease activity. There were almost twice as many smokers in the delayed treatment group (table 1). In 50/104 patients (48%), infliximab was restarted after the DAS had increased to over 2.4 in a median 17 months (IQR 3–47). Infliximab was discontinued for 1 year or more in 29 patients (58%). In 84%, 27/34 from the initial and 15/16 from the delayed infliximab treatment groups, a DAS of 2.4 or less was regained after the re-introduction of infliximab within a median 3 months (IQR 2–5). In five patients (10%), who had initially had a good response to re-introduction, infliximab was later abandoned for another DMARD. Five patients had an infusion reaction after the re-introduction of infliximab. These infusion reactions were reported as non-serious, but the reason for four patients to discontinue infliximab. In comparison, eight of 120 patients from the initial treatment group (group 4) of the BeSt study had an infusion reaction during their first treatment with infliximab (p=0.46). Serious infections (requiring hospital admission) occurred in 40/1000 patient-years after the re-introduction of infliximab, compared with 16/1000 patient-years during the first treatment with infliximab and 10/1000 patient-years during the cessation of infliximab. Radiographs 1 year before, in the year of, and 1 year after infliximab cessation were available in 90/104 patients. Median damage progression was 0 both for patients who had an increase of the DAS to over 2.4 in the first year after cessation and patients whose DAS remained at 2.4 or less (p=0.56). The average damage progression did not increase in the year after cessation compared with the year before cessation: 0.0 (IQR 0.0–0.8) versus 0.0 (IQR 0.0–1.5), p=0.06. Four patients showed radiographic progression greater than 5 (figure 2). One of these patients had restarted infliximab in that year, the other three continued to have a DAS of 2.4 or less (mean area under the curve DAS 2.0 in that year). Probability plot of joint damage progression 1 year after cessation (90 patients with radiographic data). DAS, disease activity score; SHS, Sharp/van der Heijde score. HAQ scores at 1 and 3 years after cessation were similar to HAQ scores at cessation in both restarters and patients with sustained DAS of 2.4 or less. Five years after cessation, restarters had a median HAQ of 0.7, versus 0.3 at cessation, p=0.02. For patients with sustained DAS of 2.4 or less, the median HAQ remained 0.1. Patients who flared in that year or the year before had higher median HAQ scores than patients who did not flare in those years: 0.4 versus 0.1 in year 1, 0.5 versus 0.1 in year 3 and 0.8 versus 0.4 in year 5, but these differences were not significant. Univariable Cox analyses showed that smoking, longer symptom duration at cessation, longer infliximab treatment duration, physician's assessment of disease activity, total erosion score at the time of infliximab cessation and previous yearly change in SHS were associated with the re-introduction of infliximab (table 2). Treatment timing (delayed vs initial infliximab) and positivity for shared epitope (SE) showed a trend. Univariable analyses for the delayed and initial treatment groups separately showed similar effect sizes, with the exception of smoking (lower HR) and SE (higher HR) in the delayed treatment group (table 2). The multivariable analyses yielded a model with smoking, SE and treatment duration, adjusted for treatment timing. Treatment duration was dichotomised with 18 months (fourth quartile) as the cut-off value. The possible interaction between smoking and SE could not be assessed due to small numbers. Smoking (HR 2.1, 95% CI 1.1 to 4.2), treatment duration of 18 months or longer (HR 2.4, 1.1 to 5.4) and the presence of SE (HR 3.7, 1.3 to 10.6) were independently associated with the re-introduction of infliximab (table 3). Infliximab-free survival was investigated based on the number of predictors present (figure 3). Of the 18% of patients who had no predictors present, 94% did not need infliximab re-introduction. Of the 40% who had one predictor present, 42% needed infliximab re-introduction, compared with 67% of the patients with two or more risk factors. Because SE is rarely known in clinical practice and SE and anti-citrullinated protein antibody (ACPA) status are highly correlated, we repeated the analyses using ACPA instead of SE. ACPA was not an independent predictor in the original model, or after omitting smoking. However, of the 18 patients who were non-smokers, had short treatment duration and were ACPA negative, only two (11%) needed infliximab re-introduction (figure 3D). Kaplan–Meier plots, showing the percentage of patients with persistent disease activity score (DAS) of 2.4 or less after the cessation of infliximab (IFX) over time for all patients (A), per treatment group (B) and per number of risk factors with shared epitope (SE) (C) and with anti-citrullinated antibodies instead of SE (D). In the BeSt study, 45% of patients treated with infliximab were able to discontinue infliximab. Eighty per cent of these patients could stop for at least 1 year, and 52% did not restart during a median follow-up of 7.2 years. In the year after infliximab cessation, significant joint damage progression was rare, regardless of disease flare. Retreatment with infliximab was successful in 84%. Smoking, SE and long infliximab treatment duration (≥18 months) were independent predictors of the re-introduction of infliximab. Our results are in line with previous reports, although there are differences in patient characteristics, requirements to discontinue or restart TNF blockers and the duration of follow-up. Quinn et al7 were the first to report on the successful cessation of a TNF blocker (infliximab), in seven of 10 patients with early RA, regardless of disease activity (which in general was low). Brocq et al3 reported on 21 patients with advanced RA who were in remission after delayed treatment with a TNF blocker (six as monotherapy). Five patients successfully stopped the TNF blocker for 12 months. The 16 who flared regained remission after retreatment. Saleem et al6 reported a 40% overall success rate in 2 years in 47 patients who had achieved remission and discontinued TNF blockers. Remission was maintained in 60% of patients who had the TNF blocker as initial treatment, compared with three of 20 patients who had had delayed treatment (10 had failed on a previous TNF blocker). The Remission Induction by Remicade in RA (RRR) study by Tanaka et al4 has a comparable sample size to ours, and infliximab was also discontinued if a DAS of 2.4 or less was repeatedly achieved. The rate of successful discontinuation of infliximab in 1 year was 55%, compared with 80% in 1 year in the BeSt study. This may be due to a high percentage of BeSt patients who had received infliximab as initial treatment, whereas in the RRR study, all patients received infliximab after failure on various systemic DMARD. The differences in patient characteristics and follow-up duration may also explain why Tanaka et al4 found remission at cessation to be predictive of maintaining a DAS of 2.4 or less, whereas we did not. The percentage of infusion reactions after retreatment was not increased when compared with infusion reactions during initial treatment in group 4 of the BeSt study, so the hypothesis of Takeuchi et al8 of an increased risk of infusion reactions after the re-introduction of infliximab was not confirmed. This might be explained by the design of the BeSt protocol: Methotrexate is continued after the cessation of infliximab until sustained remission is achieved on the maintenance dose, and in patients in drug-free remission who flare, first methotrexate is re-introduced and increased before infliximab can be restarted. The presence of antibodies to infliximab was not tested. To our knowledge, the inverse association between smoking and SE and successful infliximab cessation has not previously been reported. Both characteristics are associated with more severe disease.14 15 Smoking, but not SE, might be associated with poor response to TNF blockers.15,–,18 Smoking and SE are associated with increased ACPA levels,19 but neither our analysis nor the analysis by Saleem et al6 showed a strong association between ACPA and successful cessation, although this may be due to relatively small numbers. For daily practice this is disappointing, because it is not current routine to test for SE. Our analyses did show that of the non-smoking, ACPA-negative patients with short infliximab treatment duration, only 11% needed to restart infliximab. In the BeSt study, the tapering and cessation of infliximab was DAS steered. 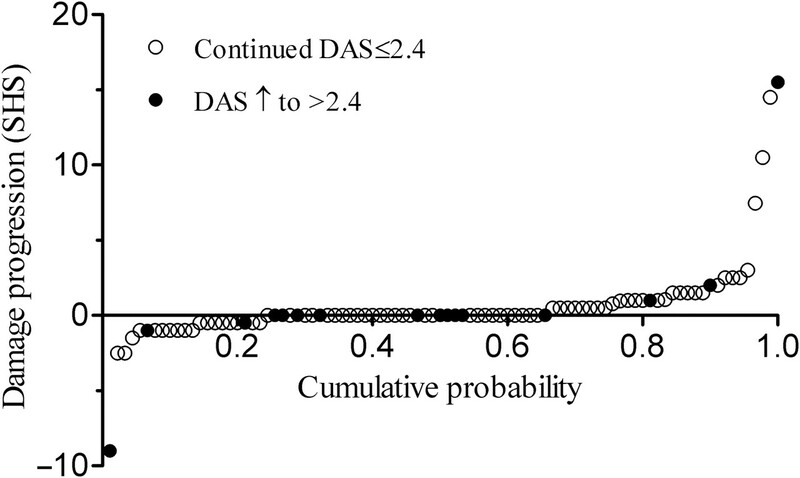 Therefore, the association between shorter infliximab treatment duration and continued DAS of 2.4 or less after cessation correlated with the time to achieve a DAS of 2.4 or less for 6 months consecutively while on infliximab. Previously, we reported that patients from the BeSt study who received infliximab as initial treatment were more likely to achieve a DAS of 2.4 or less and discontinue infliximab than patients from the delayed treatment group.20 In the current analysis, an association was found between successful cessation and initial treatment. As patients in groups 1–3 only started methotrexate plus infliximab after failing on three treatment steps, they had longer symptom durations at the time of infliximab cessation, and probably more difficult-to-treat RA than the unselected patients who started with initial methotrexate plus infliximab. The differences in disease characteristics at baseline between the initial and delayed treatment groups corroborate this (table 1). Despite these differences, we combined patients from both groups for the analysis, because we set out to find predictors of successful cessation irrespective of treatment timing, and to gain power. In separate analyses for the two groups, we found similar effect sizes, with the exception of smoking in the delayed treatment group, possibly due to small numbers and a higher proportion of smokers in this group. Previously, we compared the response to infliximab in both treatment groups using propensity scores to adjust for the differences at baseline. As the current subanalysis compares selected patients from the two treatment groups who discontinued infliximab because of a sustained DAS of 2.4 or less, this method cannot be applied. The association between treatment timing and successful cessation was also described by Saleem et al,6 but that study had comparable limitations. The observed association is thus affected by patient selection based on earlier failure on at least three non-biological DMARD treatment steps and the initiation of infliximab after a ‘delay’ of on average 14 months. Of course in daily practice, in which TNF blockers are currently reserved for patients who fail on non-biological DMARD, one must assume that similar selection processes are at work. A second limitation of this subanalysis is that for 16/104 patients, the SE status was not known. We included SE in the multivariable model because of the strong association with successful cessation. This resulted in the exclusion of the patients with missing SE data. In conclusion, infliximab can be successfully stopped for at least 1 year in 80% of patients. Joint damage does not increase in this year, regardless of flare. After a median period of 7.2 years, 52% had not restarted infliximab. Even temporary cessation can benefit both the individual patient and, given the high costs of TNF blockers, society as a whole. Non-smoking, SE-negative or ACPA-negative patients who needed less than 18 months of infliximab treatment very rarely have to restart infliximab due to an increase of the DAS to over 2.4. However, not all of those who have to restart infliximab regain a DAS of 2.4 or less, and restarting infliximab carries a (small) risk of (mild) infusion reactions. We therefore recommend that in particular for patients with one or more of the above-mentioned risk factors, infliximab discontinuation has to be carefully considered on an individual basis. The authors would like to thank all patients as well as the following rheumatologists (other than the authors) who participated in the Foundation for Applied Rheumatology Research (all locations are in The Netherlands): WM de Beus (Medical Center Haaglanden, Leidschendam); C Bijkerk (Reinier de Graaf Gasthuis, Delft); MHW de Bois (Medical Center Haaglanden, The Hague); H Boom (Spaarne Hospital, The Hague); M de Buck (Medical Center Haaglanden, Leidschendam); G Collée (Medical Center Haaglanden, The Hague); JAPM Ewals (Haga Hospital, The Hague); AH Gerards (Vlietland Hospital, Schiedam); RJ Goekoop (Haga Hospital, The Hague); YPM Goekoop-Ruiterman (Haga Hospital, The Hague); BAM Grillet (Zorgsaam, Terneuzen); JHLM van Groenendael (Franciscus Hospital, Roosendaal); KH Han (Medical Center Rijnmond-Zuid, Rotterdam); JMW Hazes (Erasmus University Medical Center, Rotterdam); MH de Jager (Albert Schweitzer Hospital, Dordrecht); MV van Krugten (Admiraal de Ruyter Hospital, Vlissingen); H van der Leeden (retired); WF Lems (VUMC, Amsterdam); MF van Lieshout-Zuidema (Spaarne Hospital, Hoofddorp); PAHM van der Lubbe (Vlietland Hospital, Schiedam); C Mallée (Kennemer Gasthuis, Haarlem); ETH Molenaar (Groene Hart Hospital, Gouda); M van Oosterhout (Groene Hart Hospital, Gouda); AJ Peeters, MD (Reinier de Graaf Gasthuis, Delft); HK Ronday (Haga hospital, The Hague); AA Schouffoer (Groene Hart Hospital, Gouda); PEH Seys (Lievensberg hospital, Bergen op Zoom); PBJ de Sonnaville, MD (Oosterschelde Hospital, Goes); I Speyer, MD (Bronovo Hospital, The Hague); KSS Steen, MD (Kennemer Gasthuis, Haarlem); GM Steup-Beekman (Bronovo Hospital, The Hague); JPh Terwiel, MD (Spaarne Hospital, Hoofddorp); AE Voskuyl, MD (VU Medical Center, Amsterdam); ML Westedt, MD (Bronovo Hospital, The Hague); S ten Wolde, MD (Kennemer Gasthuis, Haarlem); JMGW Wouters, MD (Sint Franciscus Gasthuis, Rotterdam); D van Zeben, MD (Sint Franciscus Gasthuis, Rotterdam). The authors would also like to thank all other rheumatologists and trainee rheumatologists who enrolled patients in this study, and all research nurses for their contributions.
. Treatment of rheumatoid arthritis: state of the art 2009. Nat Rev Rheumatol 2009;5:531–41. ; RRR study investigators. Discontinuation of infliximab after attaining low disease activity in patients with rheumatoid arthritis: RRR (Remission Induction by Remicade in RA) study. Ann Rheum Dis 2010;69:1286–91.
. Patients with RA in remission on TNF blockers: when and in whom can TNF blocker therapy be stopped? Ann Rheum Dis 2010;69:1636–42.
. Postmarketing surveillance of the safety profile of infliximab in 5000 Japanese patients with rheumatoid arthritis. Ann Rheum Dis 2008;67:189–94.
. Clinical and radiographic outcomes of four different treatment strategies in patients with early rheumatoid arthritis (the BeSt study): a randomized, controlled trial. Arthritis Rheum 2008;58(2 Suppl):S126–35.
. Survival analysis Part III: multivariate data analysis – choosing a model and assessing its adequacy and fit. Br J Cancer 2003;89:605–11.
. How to reduce morbidity and mortality from chest infections in rheumatoid arthritis. Clin Med 2010;10:326–9.
. The rheumatoid arthritis HLA-DRB1 shared epitope. Curr Opin Rheumatol 2010;22:293–8.
. Predictors for remission in rheumatoid arthritis patients: a systematic review. Arthritis Care Res (Hoboken) 2010;62:1128–43.
. 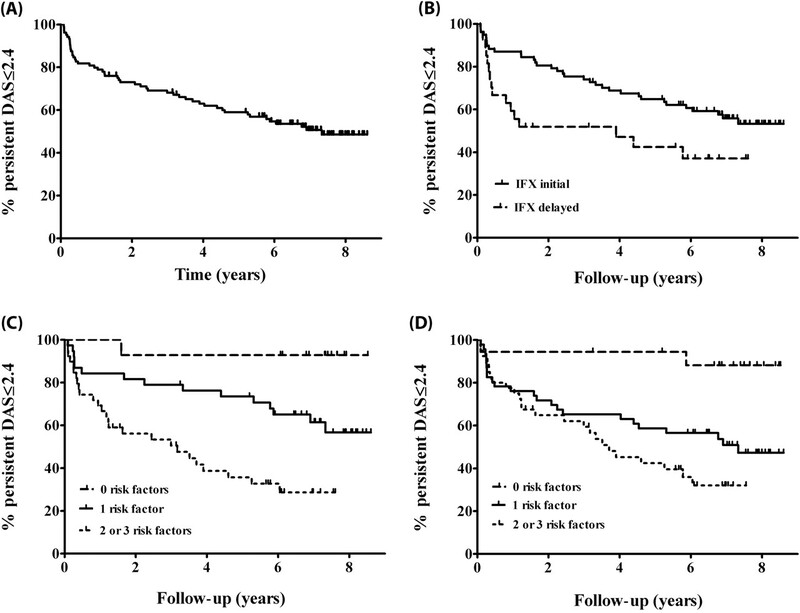 Associations between tumor necrosis factor-alpha (TNF-alpha) -308 and -238 G/A polymorphisms and shared epitope status and responsiveness to TNF-alpha blockers in rheumatoid arthritis: a metaanalysis update. J Rheumatol 2010;37:740–6.
. Relationship between pack-year history of smoking and response to tumor necrosis factor antagonists in patients with rheumatoid arthritis. J Rheumatol 2009;36:1180–7. ; British Society for Rheumatology Biologics Register. Predictors of response to anti-TNF-alpha therapy among patients with rheumatoid arthritis: results from the British Society for Rheumatology Biologics Register. Rheumatology (Oxford) 2006;45:1558–65.
. The HLA-DRB1 shared epitope alleles differ in the interaction with smoking and predisposition to antibodies to cyclic citrullinated peptide. Arthritis Rheum 2007;56:425–32.
. Clinical and radiological efficacy of initial vs delayed treatment with infliximab plus methotrexate in patients with early rheumatoid arthritis. Ann Rheum Dis 2009;68:1153–8. Funding The study was designed by the investigators and supported by a government grant from the Dutch College of Health Insurance Companies, with additional funding from Centocor and Schering-Plough. Data collection, trial management, data collection, data analysis and preparation of the manuscript were performed by the authors. Ethics approval This study was conducted with the approval of the medical ethics committees of all participating centres.